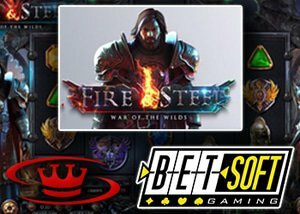 Software Producer Betsoft Gaming added its latest gaming entitled, Fire & Steel to its renowned Slots3 collection. It is to believe that this slot is one of BetSoft's more innovating games in some time. All their games are great, but this one just ups the ante a bit! New Fire & Steel can be launched on mobile as well as web browser devices from July 24, 2017 at all Betsoft platforms across the globe. This new online slot Fire & Steel are based on a widely-adored fantasy theme and will keep all gaming fanatics captivated with its epic soundtrack and refined gameplay. New Fire & Steel slot features with top-quality, breathtaking 3D graphics, as well as unique 3-4-5-4-3 reel format .Players will find themselves in the middle of the clash between good and evil, a gameplay that will assure hours of online entertainment action. Fire & Steel has a huge betting range of £0.20 up to £100 per spin and there is a top payout of 500x up for grabs. The reels in this slot are guarded by warriors on either side and the high-value symbols include a crown, purple and yellow crests, a book, a cup, a helmet and a dagger. There are two special symbols, the Swordsman and the Shieldmaiden. The main bonus features are centred upon these two special symbols. When the Swordsman symbol lands on the reels all the symbols above and below him in the reel will turn wild. When the Shieldmaiden symbol lands on the reels and the symbols to the left and the right in the same row as her will turn wild. If the two special symbols land at the same time and the transformations meet then the free spins are triggered. You will be awarded ten free spins and the space where the two transformations met will remain wild throughout the spins. What's more, it is possible to retrigger the spins. The slot also has a gamble feature that can be used in the base game to try and double winnings. It is a Heads or Tails game and the process can be repeated numerous times. However, one incorrect guess results in all winnings being lost. The struggle is real when it involves those seeking royal power after assassinating the queen and is unable to name a successor. New Slot Fire & Steel is described by Betsoft as an asset for any operator looking to extend session play times and profitability. This online slot is released on Betsoft's Shift ™ platform that incorporates HTML5 technologies for the deliverance of high definition animations in 3D style. Look for the new Fire & Steel slot at all Betsoft providers channels. Enjoy a Betsoft No Deposit Bonus when playing this fabulous slot at any of these no deposit bonus casinos. Free Spins bonuses are the best way to try a new casino, on this site we give tips over new casinos all new latest signup free spins bonuses, as well as Casino reviews with the latest deposit and no deposit bonus, offers for desktop and mobile player. As an online betting review site, we recommend you visit Cashpot Casino the number one choice for real money Canadian punters. New players looking to dive into this new site can claim the exclusive Cashpot Casino no deposit bonus worth $10 by using the code - COF10 - and start by trying the games out with the courtesy of this great offer. When it comes to delivering mind-blowing features, Cashpot Casino has got you covered with their extensive range of special offers. There are a couple of deals in the promotions section. After redeeming the no deposit bonus code, the new player welcome bonus consists of 300% up to €1000. The website also has a surprise deal which is rather rare in the online casino realm, mainly a 15% payment method deposit bonus. This deal only applies to users of Neteller, Skrill and Postepay. Furthermore, the casino provides a free casino bonus upon request. Be sure to keep an eye on the promotions page of the website so you don't miss out on exciting deals. If you want to play the new Fire & Steel slot why not visit Cashpot Casino today.